This vertical jig head designed by Peter Lahti is meant for ice fishing or vertical jigging from boat. When you are using this vertical jig head together with Peter Lahti jigs, you have the unbeatable lure for pikeperch and pike! The slow motion of the lure makes even the most cautious fish to strike and the strong hook quarantees that the fish does not get loose. 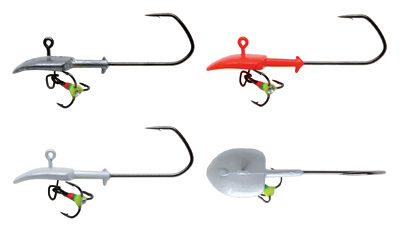 The package contains three differently colored jig heads. The lightened jig head sinks slowly which enables the possibility for slow and smooth reeling of the lure. Big sized jig head acts as the stabilizer of the jig body making the jig not to spin. The length of the casts will stay long since the weight of the jig head is heavy enough.